Goldie Socks And The Three Libearians Unit: ~ Picking Just Right Books, Goldilocks Activities and So Much More! This Best Seller Is Newly Expanded To 132 Pages! 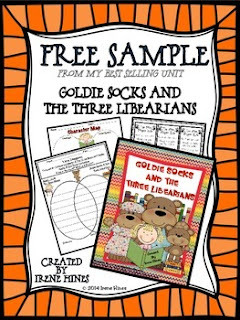 Goldie Socks and the Three Libearians is an adorable retelling of the classic fairytale, Goldilocks and The Three Bears. This book is the perfect story for children (and their parents) to understand what “just right book” reading is all about. Choosing a “just right” book is an important skill for all students. One of the author’s purposes in this book is to inform the reader about the five finger rule. This unit is a great way to launch picking just right books for independent reading. A Reading Workshop must! ~Foldable Line Inserts If You Want Lines Inside Your Foldable Activities! ~Many of the printables can be used for extra practice, independent activities, morning work, informal assessments or with literacy groups.